Yellow lupin (Lupinus luteus L.) is one of the 200 species of lupins, a genus of multipurpose annual legumes grown throughout the world both for their seeds used in feed and food, and for forage. Lupin seeds can be an alternative to soybean in all livestock species due to their high content in good quality protein (in the 30-40% range). Lupins also contribute to the sustainability of cropping systems (Lucas et al., 2015). The other main cultivated lupin species are the white lupin (Lupinus albus), the blue lupin (or narrow leaf lupin) (Lupinus angustifolius) and the pearl lupin (Lupinus mutabilis) (Jansen, 2006). White and yellow lupin seeds provide higher protein than blue lupin seeds, which may be of importance when lupins are used to feed animals (Soya UK, 2017). Yellow lupin (Lupinus luteus) is mostly grown as fodder or green manure. However, in eastern Europe, it is increasingly cultivated for its seeds. As for white lupin there are sweet and bitter types of yellow lupin. Bitter types are mostly used for green manure (Terekhina, 2008). Lupinus luteus grows to a height of up to 0.8 m. It is strongly taprooted and its stalk is densely hairy. The leaves are compound and palmate with 9-11 leaflets. The leaflets are linear to ovate and pointed. The inflorescence is a long spike-like raceme, containing 6-10 whorls of 5 fragrant yellow papillonaceous flowers each. The corollas are bright yellow or orange. The fruits are densely hairy flat pods, 4-5 cm long x 1.1-1.3 cm wide. The pods contain 4-6 seeds. The seeds are reniform, smooth, white or white with brown to black speckles. The weight of 100 seeds is 120-140 g (El Bassam, 2010; Terekhina, 2008). Yellow lupin is mainly used as a feed for livestock and poultry (Roth-Maier et al., 2003; Zdunczyk et al., 2016; Kim et al., 2008; Somchit-Assavacheep et al., 2013). It is cut for silage. It is a very effective N-fixing legume, accumulating about 330 kg N/ha (Wolko et al., 2010). Yellow lupine can be used for land reclamation (Pietrzykowski et al., 2017). It is also a nice ornamental, attractive to bees. Lupins (Lupinus spp.) are separated into New world species and Old world species. Of the main cultivated species, white, blue and yellow lupins are Old world species, while pearl lupin is an American species. All of them are smooth seeded. Lupins occupy almost all kinds of habitats from sea level to altitudes up to 4000 m (Wolko et al., 2010). Yellow lupin (Lupinus luteus) is native to the West of the Mediterranean Basin. It was known as an edible pulse and cultivated as a forage crop and medicine species as early as 2000 BCE (Terekhina, 2008). It is found in Portugal, in coastal areas of Spain and in Italia. It was introduced in Russia as an ornamental plant in the 19th century. It has recently been referred to be cultivated on a 1.5 million ha area within the territory of the former USSR. It is grown in Belarus, marshy woodlands of Ukraine, in the Baltic States, and central regions of Russia (Terekhina, 2008). Sweet varieties of yellow lupin have been developed in Germany and Poland. It also grows in South Africa and in Australia where it is considered to be invasive. Yellow lupin is more confined to sandy, acidic soils and natural populations are much less widespread than white or blue lupin (Wolko et al., 2010). It does not require fertilizer and it can grow on marginal lands of low fertility. Yellow lupin is a summer growing species. Optimal temperature for growth was reported to be in the 20-25°C range. Temperatures above 30°C are deleterious to the crop. 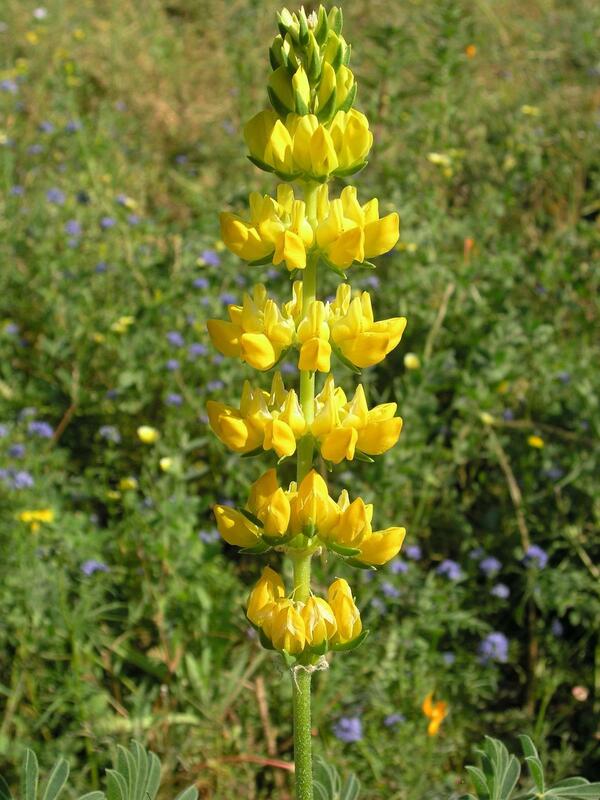 Yellow lupin is relatively drought resistant, once its root system is well established. However seed yield is impaired by water stress (Pszczolkowska et al., 2003). Yellow lupin does well on sandy and sandy-loamy soils and it has some tolerance of Al toxicity in acidic soil conditions (Terekhina, 2008; Grauer et al., 1990). It is a full sunlight plant and it does not withstand frost (Terekhina, 2008). When yellow lupin is intended for fodder production, it should be directly sown during mid spring at a depth of 2.5 cm and at a rate of 70-80 seeds/m², targeting 50-70 plants/m² (PGRO, 2014). Sowing at higher rates (125-150 seeds/m²) could be a good way to prevent weeds (PGRO, 2014). The seedlings require moisture for good establishment. Delaying sowing date may have deleterious effects on seed protein content (Podlesny et al., 2007 cited by Jarecki et al., 2014). Lupins are N-fixing legumes that are reported to fix 300-400 kg N/ha in Europe and Australia (Jansen, 2006). Yellow lupins are reported to have the highest N-fixing potential among other lupins (Wolko et al., 2010). Lupins can provide benefit to the following crop (PGRO, 2014). In organic crops, lupins were demonstrated to result in a 0.5 t/ha response in rye grown following yellow lupins compared to following spring beans. Lupins are valuable legumes for sustainable P management. In soils depleted in available P, lupin plants form specialized cluster root structures and/or release P-mobilizing carboxylates that free it from insoluble forms (Lambers et al., 2012). Thanks to its deep taproot, yellow lupin improves soil texture and drainage (Jansen, 2006). In Poland, yellow lupin has been recommended for sand mine cast reclamation before afforestation (Pietrzykowski et al., 2017). Yellow lupin seeds are rich in protein (34-48% DM), much richer than those of blue lupin and richer than those of white lupin. Like all lupin seeds, yellow lupin seeds are relatively poor in fat, fibre and contain very limited amounts of starch. The bitter earlier varieties of lupins contained a toxic alkaloid and were not recommended for animal feeding unless the alkaloid was removed by soaking in water. The newly obtained sweet (alkaloid-free) varieties, which can be distinguished by taste and smaller growth, are palatable to stock. The alkaloid content of yellow lupin seeds ranged from 0.72 to 1.53 g/kg DM in Poland, depending on cultivars and cultivation conditions (Lubowicki et al., 2005; Niwińska, 2001). 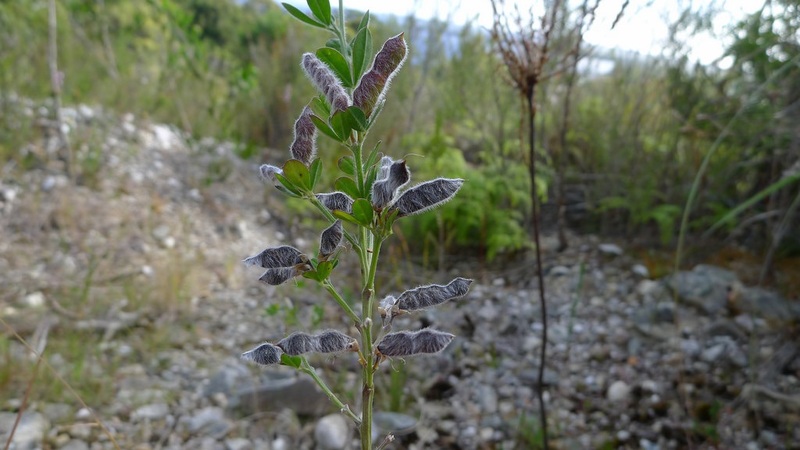 Alkaloid content varies upon climatic factors such as droughts that can have a major influence on the accumulation of secondary metabolites: over 6 years, the alkaloid content of yellow lupin varied from 1.07 to 1.48 g/kg DM (Lubowicki et al., 2005). The alkaloid content raised concern in piglets over a dietary content of 20 mg/kg in Australia, and over 120 mg/kg in Poland (Godfrey et al., 1985; Buraczewska et al., 1993). Lupin seeds contain significant levels (from 7 to 20%) of oligosaccharides of the raffinose family (Saini, 1989). Alpha-galactosides levels can reach up to 20% in the seeds of blue or yellow lupin species (Saini, 1989). The oligosaccharide level may depend on variety but also on conditions of cultivation and harvest (Pisarikova et al., 2009). Yellow lupin (Lupinus luteus) is a valuable species for ruminants due to the high protein content of its seeds that can be used as an alternative to soybean meal. Yellow lupin seeds have slightly higher energy than soybean meal in beef and dairy cattle (Berk et al., 2008). Yellow lupin seeds can be used whole or ground, and they have much higher protein content than other lupin seeds (Niwińska, 2001). However, as for white lupin (Lupinus albus), the high rumen degradability of protein and amino acids may result in a low metabolizable protein (MP) value. No study was found to prove the enhancing effect of processing yellow lupin seeds, but processing has probably the same beneficial effects as for white lupin seeds. Rumen effective protein degradability of yellow lupin seeds was much higher (82%) than that of soybean meal (65%) and also higher than that of blue lupin seeds (77%) (Niwińska, 2001; Zebrowska et al., 1997). The soluble fraction (a) was much higher (60% vs. 20%) than that of soybean meal and the degradable fraction (b) was twice that of soybean meal (Niwińska, 2001). The rumen-undegraded protein was digested during intestinal passage, over 93% (Niwińska, 2001). In lupin, only 3% of N and 2% of essential amino acids were absorbed in the intestine (Zebrowska et al., 1997). Yellow lupin seeds have relatively high digestibilities in ruminants. Digestibilities of OM, protein and fat were respectively 75%, 71% and 34%. Energy values were 11.4 MJ/kg DM for ME and 6.7 MJ/kg DM for NEL (Net Energy of Lactation) (Roth-Maier et al., 2004b). These values were comparable to those of blue lupin seeds but were found to be much lower than those of white lupin seeds (-3 MJ for ME and -1.5 MJ for NEL) (Roth-Maier et al., 1995). Fermentation parameters of yellow lupin ground seeds were assessed in vitro in goat rumen liquid. The addition of yellow lupin seeds reduced methane emissions and it was thus suggested that the addition of yellow lupin could reduce energy losses during rumen fermentation (Zawadzki et al., 2010). Ewes could receive 500 g/day yellow lupin seeds to replace the same amount of concentrate in a high energy and high protein diet. Yellow lupin seeds did not alter average weight of ewes. The number of small and large follicles increased in the lupin-fed group though not significantly (Somchit et al., 2007). Lactating ewes received 15 or 30% yellow lupin seeds in their diet without any effect on ewe body weight, DM intake, milk production or milk composition at the exception of quinolizidinic alkaloid which increased from 1.9 mg/kg to 5.6 mg/kg milk at 15 and 30% inclusion, respectively (Lança et al., 2001). Calves could be fed on 10 or 25.6% ground yellow lupin seeds as a partial or total replacer of soybean meal in isoenergetic and isonitrogenous milk-based diets during 120 days or till they reached 120 kg BW. The inclusion of yellow lupin decreased average daily gain from 772 g/d in control to 742 g/d at 10% and from 610 g/d in control to 579 g/d at 25.6%. However, feed conversion ratios were improved (Olkowski et al., 1992). In the case of mixed intercropping with spring cereals, the feed energy content for cattle by using spring wheat or barley as partner was higher than a comparable mixture of wheat and soybean meal. When grown in mixture, the proportion of lupins to cereal grains should be higher in relation to spring cereals, in order to increase the protein content (Berk et al., 2008). This silage made with yellow lupin seeds had 64% DM digestibility in sheep but was poorly consumed in comparison to other silages (faba, pea or soybean) (39.5 g DM/kg W0.75 vs. 46.6, 47.1 and 64.9 g DM/kg W0.75). Yellow lupin provided the best N retention (5.9 g/d) (Serrano et al., 1989). Yellow lupin has a better nutritional value for pig feeding than white and blue lupin due to its higher protein and amino acid content, and to its lower fibre content (Shea et al., 1996). 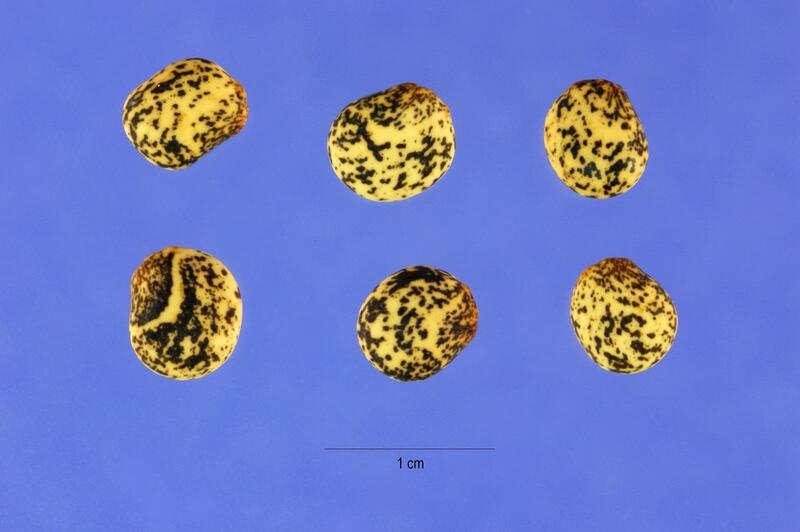 Yellow lupin seeds have been assessed to replace soybean meal in various experiments (Kim et al., 2008). DM digestibilities of two German cultivars of yellow lupin were respectively 73 and 79%, and ME values were 13.8 and 14.3 MJ/kg DM (Roth-Maier et al., 1993). Digestibilities of crude fibre, hemicellulose and NDF were respectively 86, 88 and 87% in pigs (Just et al., 1983). This was in accordance with the value of 85% for crude fibre digestibility observed in 1960 (Vosloo, 1960). In the feeding of young animals with immature digestive system, lupins must be used cautiously though they were not found to cause any problem in health parameters and digestive organs (liver, pancreas or spleen) (Hanczakowska et al., 2017; Seabra et al., 2001). Yellow lupins were reported to have high DM and crude protein digestibilities, respectively 91 and 90%, comparable to those of a soybean meal based diet. However, nitrogen utilisation in diets containing yellow lupins was lower than with soybean meal diet (Gdala et al., 1996). The inclusion levels for lupins and more specifically for yellow lupins have not been stated unequivocally. Before 2000, several experiments had concluded that it was possible to include yellow lupins in piglet diets up to 31% (Gdala et al., 1996). In 1988, in Germany, a piglet diet with up to 30% yellow lupin seeds was reported to have a positive effect on the performance of weaned pigs (10-25 kg) (Böhme, 1988). Yellow lupin included at 25% of the diet to totally replace soybean meal improved N-balance in growing pig (25 kg) diets. The lupin content of the diets had no effect on the digestibility coefficients in the experimental diets (Bugnacka et al., 1999). In more recent studies, a 25% dietary inclusion of yellow lupins was shown to significantly decrease feed intake, which could be explained by the effects of alkaloids on palatability (Bugnacka et al., 2001). In another experiment, increasing dietary yellow lupin concentrations tended to decrease average daily gain while not increasing feed intake, and had thus deleterious effects on feed conversion ratio (FCR). Yellow lupin could optimally replace soybean meal at a relatively high level in piglet diets (15% of the diet) without any problem (Kim et al., 2008). When pigs received 8% yellow lupins during the first half of the fattening period (23-60 kg BW), almost all the animals tended to grow faster than those on control diet, although the difference was not significant (Hanczakowska et al., 2017). These results are on the same trend as those obtained earlier when soybean meal was replaced by 20% yellow or blue lupin seeds. Fattening pigs had better performance on lupins than on soybean meal used as a control (Roth-Maier et al., 2004a). In a much earlier experiment, fattening pigs from 33 to 92 kg received 9% or 16% yellow lupin without impairing their performance or FRC. However, it was recommended to limit yellow lupin inclusion at 9% because carcass quality was reduced at higher levels (Santos Oliveira et al., 1991). These deleterious effects of yellow lupin on meat quality were confirmed with lower PUFA content, lower quality parameters such as dressing yield, meat of ham, loin eye area and meat of primal cuts (Hanczakowska et al., 2017). The inclusion of 8% yellow lupin unprocessed seeds in the diet of pregnant sows and of 12% in lactating sow diets resulted in significantly lower mean litter weight of the piglets than that from the control group fed soybean meal. The daily body weight gains before weaning were lower (p < 0.01) in groups receiving yellow lupin than in the control. It was recommended to limit yellow lupin inclusion in sow diets (Hanczakowska et al., 2014). Nutritional value and suitability of lupins for poultry feeding vary greatly according to the variety: sweet or bitter lupins, yellow, blue or white lupins, and composition, treatments, etc. (Jeroch et al., 2016). Protein, amino acid content and fatty acid content of lupins suggest that they are valuable raw materials for poultry feeding. However they are poorly used since they are poorly available for feed manufacturers or poultry producers. The interest of lupins for poultry feeding must be discussed according to their ME value, aminoacid digestibility and to their anti-nutritional factors content (alkaloids, oligosaccharides, etc.). According to the variety and the cultivar, their ME value can be higher than 10 MJ/kg DM, but values as low as 8.3 MJ/kg DM were observed for seeds whose oligosaccharide contents (mainly raffinose) were high (Kaczmarek et al., 2016). The mean protein content is close to 40% DM, but large variations are observed. The protein content of yellow lupin is higher than that of white lupin (Sujak et al., 2006). Amino acid profiles vary according to the family or cultivar. White and blue lupins have lower protein variablity than yellow lupins (39-44.4% DM) (Kaczmarek et al., 2016). In order to improve the nutritional value of lupins, seeds can be dehulled before feeding birds. After dehulling the non starch polysaccharide (NSP) content is reduced, the ME value is improved, and in some cases the amino acid digestibility is also improved (Brenes et al., 1993; Nalle et al., 2010). Some attempts have also been made for reducing the effect of anti-nutritional factors. Alkaloid content is reduced in sweet lupins, which contain only trace of those compounds. Currently, oligosaccharides are the main problem which limits the use of lupin in poultry diets when the diets are well balanced for energy, amino acids (methionine supply) and minerals and when sweet varieties are used. High levels of oligosaccharides (alpha-galactosides) are known to produce negative effects on digestive processes with increased digesta viscosity, reduced digestibility, sticky droppings, and consequently to reduce performances. On the contrary, small amounts of lupins are mentioned to affect favourably fermentation processes and to stimulate gut microbiota in turkey (Zduńczyk et al., 2014). With high amounts of dietary lupins (30%), ME value and amino acid digestibility are negatively correlated with raffinose and water extract viscosity (Kaczmarek et al., 2016). Alpha-galactosides are not digested in the upper part of the gastro intestinal tract of the birds. They are only fermented in the caeca and produce short-chain fatty acids, poorly used in poultry. Attempts have been made to reduce those negative effects by adding exogenous carbohydrases. Some improvements were observed in diets containing large amounts (50 and 70%) of raw lupins (Brenes et al., 1993). Yellow lupin seeds could be used to replace soybean meal in broiler balanced diets at up to 20% without any negative effect. 30% inclusion level resulted in degraded feed conversion ratio (Roth-Maier et al., 2003). Contradictory results were observed earlier, body weight reduction occurring at inclusion levels as low as 5 or 10% (Orda et al., 2006). Taking into account the variability of yellow lupin composition, maximum recommended levels in poultry diets should be 5% in starter diets and up to 20% later (Jeroch et al., 2016). Data on yellow lupin is scarce in laying hens. Yellow lupin could be included in balanced diets at up to 30% without any negative effect on laying performance and egg quality. Yolk colour and fatty acid profile were improved (Krawczyk et al., 2015). Up to 18% (no higher levels tested) yellow lupin seeds could be introduced in turkey diets during the first 8 weeks of age and the finishing period without any detrimental effects on body weight, feed conversion ratio and meat quality (Zduńczyk et al., 2014; Zdunczyk et al., 2016). Very few information is available in the international literature on the utilisation of yellow lupin seeds in rabbit feeding. In a French study, the incorporation of Lupinus luteus and L. albus seeds introduced at 20% of the diet, in comparison with a soybean meal control diet, resulted in similar performance (growth rate and feed efficiency) in growing rabbits for all experimental groups (Lebas, 1986). As a consequence of these results and because yellow lupin seeds can also be used with good results to feed various farm animals, these seeds may be considered as a raw material usable in rabbit feeding. The estimated digestible energy content of yellow lupin is about 14 MJ/kg DM (Lebas, 2016). As for other grain legumes, yellow lupin seeds or meal have been assessed to replace fishmeal in many fish diets, and yellow lupin has been reported to have good potential as fish feed (Glencross et al., 2004). Rainbow trouts are sensitive to yellow lupin alkaloids such as quinolizidine. One of the most important effect of yellow lupin quinolizidine on trouts is its anti-palatability. This is why the amount of alkaloids brought by diets containing yellow lupin seeds should not be above 100 mg/kg for trouts (Serrano et al., 2011). The inclusion of yellow lupin meal in young (36 g BW) rainbow trout diets formulated to be isonitrogenous and isoenergetic resulted in a linear decrease of fish growth and a deterioration of feed conversion ratio from the lowest inclusion level (12.5%). However feed intake was not significantly affected, except at the highest level of inclusion. N retention remained unchanged while energy efficiency declined linearly. Fish body composition remained unaltered by yellow lupin meal inclusion but some changes occurred on organs such as the gastrointestinal tract or liver without affecting overall fish health parameters (Glencross et al., 2004). Another interesting trait of yellow lupin inclusion at the highest level of inclusion in fish diets is that it provides the adequate quantity of phosphorus to fish and thus limits phosphorus output by aquaculture (Glencross et al., 2004). These results show that yellow lupins have good potential for rainbow trout feeding though they are less promising than those obtained earlier by the same authors where they had reported that rainbow trouts (84 g BW) fed on 50% yellow lupin meal had higher survival, higher feed intake, unchanged feed conversion ratio and unchanged fish acceptability, compared to a fishmeal based diet (Glencross et al., 2002). Lebas, F., 1986. Use of protein rich feeds in the growing rabbit. Colloque Franco-Polonais, Jablonna, 10-11 juin 1986, 3 pp.